The ongoing military operation, code-named “Exercise Ayem Akpatuma,” in Benue, Kogi, Nassarawa, Kaduna and Taraba states, has claimed the lives of 13 soldier, with seven other seriously wounded. This is even as the Defence Headquarters (DHQ) warned political leaders against politicising military operations. 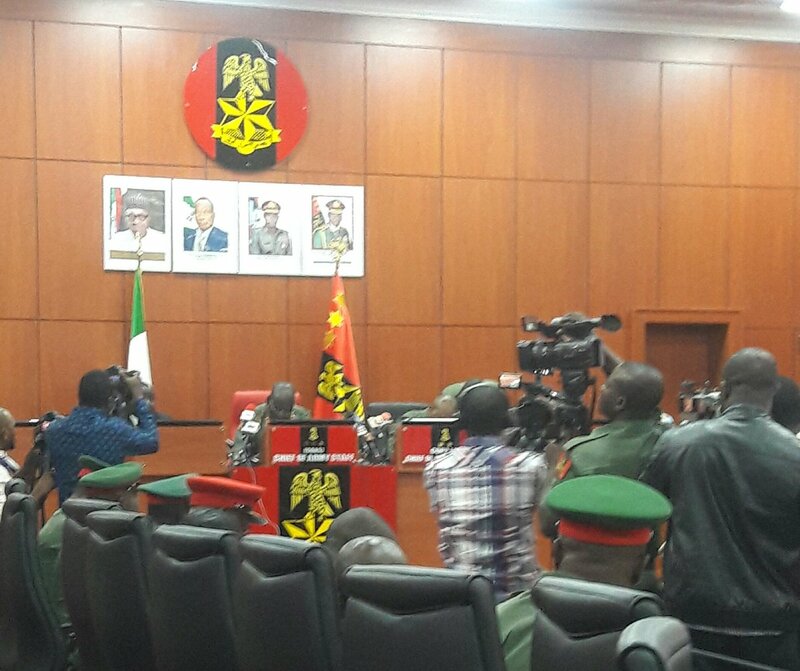 Director, Defence Information, Brigadier-General John Agim, who gave the warning at a press conference in Abuja yesterday, also disclosed that the military lost major equipment in the operation. “During the exercise, we lost some of our dear colleagues; 13 soldiers were killed in action, while seven soldiers were wounded in action. We also had our equipments destroyed during the operation,” he said. The DHQ, therefore, solicited the cooperation of the civilian populace to enable the Nigerian armed forces contain the security challenges bedevilling the nation. Agim said, “Civil authorities, at all levels, such as community chiefs, LGA chairmen and state governors are often instrumental to the success of internal security operations. This is because they provide information, synergy, support, and facilitate a conducive environment for military operations. They also assist in winning the minds and hearts of the people in support of the military, among others. “Regrettably, during the conduct of Exercise Ayem Akpatuma, some civil authorities, especially in Taraba State, did not accord the military the desired cooperation. For instance, the chairman of Takum Local Government Area in Taraba State did not cooperate with 93 Battalion but instead portrayed the military in bad light to the locals. His actions before and during Exercise Ayem Akpatuma were clearly anti-military and he incited his people on many occasions to resist and confront the military. He also blamed Amnesty Intervention for allegedly frustrating attempts by the Nigerian government to procure military equipment from some foreign countries to fight the counter-insurgency war and other security challenges. Agim, while listing the successes of the operation, said 183 criminals were arrested in Benue and Taraba for various offences. According to him, “In Benue State, 147 herdsmen, six cultists, five rustlers and six bandits were arrested, while 15 were arrested in Taraba State. In 1 Division’s area of responsibility, a total of 13 bandits were arrested. All the arrested suspects have been handed over to the Nigeria Police for further action. Any this territory native who do not quit now the enemy’s brainwashed terrorism mercenaries nickname military, police etc., must go down in the hands of the enemy or with the enemy in this climax of the ongoing Revolution War of the natives under the natives Disintegrated Republics which secures the natives existence and future in 21st century world. Strike point number one in this climax of the ongoing Revolution War of the natives under the natives Disintegrated Republics are the enemy’s brainwashed terrorism mercenaries nickname military, police etc. who are behind the attacks and killings of this territory natives in disguise as so-called herdsmen etc. for fulani fraudulent criminal sultanate political government with its emirates under the dead fraudulent political name Nigeria- Slaughter them on your God given native land, Burn Down their barracks, vehicles etc., take everything in their possession- arms etc., it is either you annihilate and erase them on your God given native land or they will annihilate and erase you on your God given native land, either you kill them or they will kill you. It is over for the dead fulani fraudulent criminal sultanate political government with its emirates in this natives territory. It is over for the dead fraudulent political name Nigeria in this natives territory. It is over for the enemy’s brainwashed terrorism mercenaries nickname military, police etc. in this natives territory. Only the Sword decides. The enemy has lost the war- march on them to full conquest. It is God given Liberation, it is God given Freedom. God Is with Us!! !